The Muslim ummah - both in the East and West - is in a state of flux. We are enslaved and subjugated mentally, spiritually and also sometimes physically by our own fears as well as from forces around us. This is very similar to the state of Muslims (Bani Israel - the Children of Israel) at the time of Musa (AS). The Muslims at that time were enslaved by Pharaoh both physically and psychologically and at the same time they had such low spirits that they would not hesitate to betray their own to save their skin. There are so many parallels between the Muslims at the time of Musa (AS) and the Muslims living in the 21st Century. Today we are enslaved through politics, through economic means, through education, and through media in addition to our own lack of spirituality and greed of materialism. The story of Musa (AS) is described in detail in the Qur'an. However very few can relate the story to the current conditions and take lessons from it. It is ironic that we do not even wonder why the story of Musa (AS) is repeated in the Qur'an in many different ways, more than any other story. 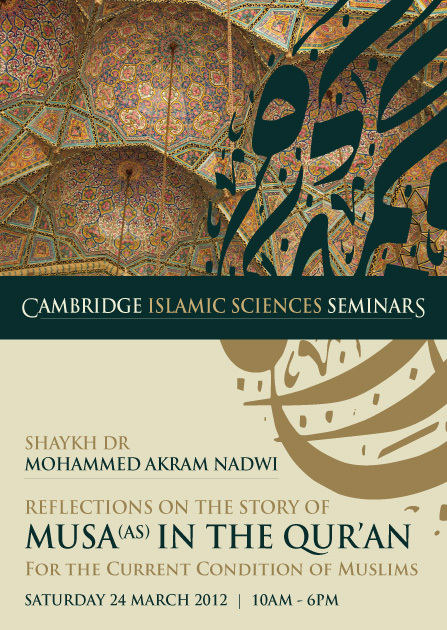 Here is the opportunity to have an in-depth understanding of the story of Musa (AS) in the Qur'an (as you may have never done before) with deep reflections and scholarly insights from Shaykh Dr Mohammad Akram Nadwi. Register on-line to book your place now and save 50% or more on standard ticket price. How to Help Non-Muslims Uncover Their Fitrah?